Making the most out of your living space can take a lot of designing and planning if you want to get the best layout to suit your outdoor space. However, this does not have to cost the earth. There are many things you can consider to keep the costs down and add your own personal touch. To start with, having an outdoor table with comfortable yet stylish seating alongside, if you have enough space, a relaxation/chill zone is a great addition to your garden, for example you could explore getting an enclosed gazebo. This will give your outdoor space multi-purpose. This added furniture allows you to lounge around and enjoy the weather during the day, and then later on that night, you can host a barbeque with enough seating area so that everyone can take a seat and socialise. If it does happen to rain, the addition of the gazebo allows you and your guests to remain outside and undercover, therefore, not allowing the weather to dictate the activities you decide to do in your outdoor living space. For smaller areas, select furniture that provides adaptability, for example, stools, fold up chairs and smaller tables that can be easily stored. 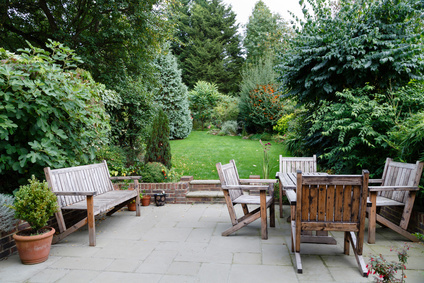 When it comes to outdoors living space, no outdoor space is complete without the addition of bit of greenery. Things such as plants and trees give you that feeling of being outside as well as adding a bit of life and colour to your garden. Potted plants and vertical gardens are a great space saver as well as being highly beautiful. These also come at a very affordable price so getting your hands on one or a few of these is easy and cheap! To add that personal touch we discussed earlier, you need to add some fancy accessories that suits your taste. There are various garden accessories you could consider buying such as, lanterns, Simply Plastics garden mirrors, gnomes, fairy lights, etc.… you get the idea. It can be bright coloured cushions or just simple accessorising, whatever you fancy. Whatever catches your eye or you think would look good in your garden is the accessory for you, so don’t overthink it. Lastly, the trickiest task of all, maintaining that beautiful outdoor living space you have created. By dedicating a few hours a week maintaining your beautiful garden, you are setting a realistic goal, as well as keeping on top of the work that comes with maintaining your outdoor living space. Knowing how to balance work and a garden can mean the difference between seeing your garden as a lot of hard work, or as a place of enjoyment, where you can enjoy your gardening activities rather than see them as a chore. Therefore, at the end of your hectic day at work, you can sit in your favourite chair and enjoy the view of your hard-earned garden, and simply unwind.